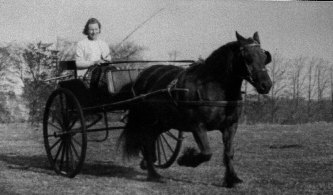 Left: The late Mrs Sylvia Hasell-McCosh driving Dalemain Celandine at home. Right: Lynn Winder, with Fell pair Tebay Annie and Tebay Fannie, storms down to Obstacle 4 at Lowther 2000. Right: Tebay Tommy and Tebay Glenlivet enjoy a session in tandem, 1999. Members of the North West Driving Club and their Fell ponies relax after a long drive across the fells between Orton and Shap, 1999. Coppyhill Suzanne at extended trot, Champion at Dufton Show 2005. 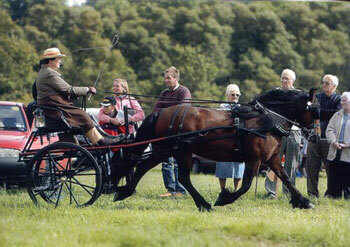 Many photos of Fells driving were taken at the 2005 Breed Show by Ken Ettridge.